Styled with icon pant and katerina jacket . I loved this sweater so much, i got it christmas in size xxs and it was the perfect fit.. just baggy enough to tuck into jeans and wear with leggings. Unfortunately it completely shrunk the first time i washed it according to the instructions and I can no longer wear it. The sleeves are extremely tight and the bottom of the top sits above my waist. Would not recommend buying unless you're never planning on washing it. so disappointed. Decent everyday sweater but beware of pilling. Love this sweater! So soft and warm. You can size down if you want a slimmer fit. Excellent fit and super comfy. I bought 2 colours! 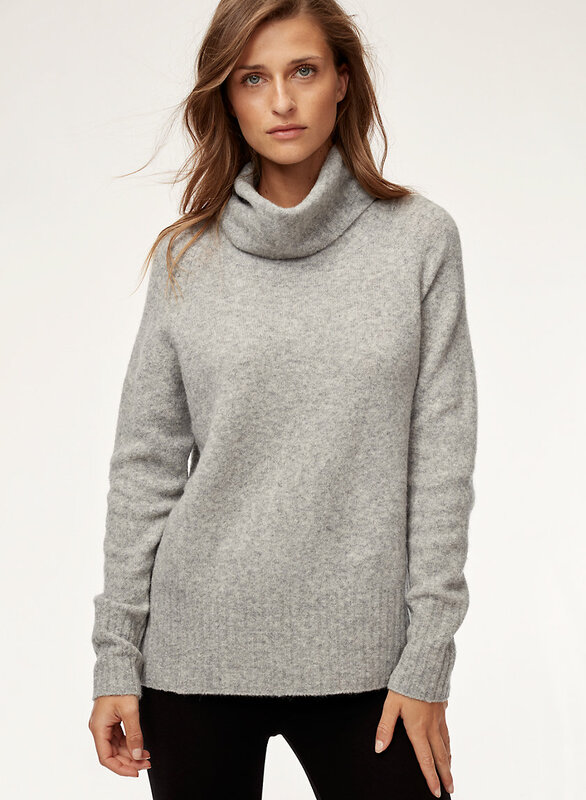 Nice light sweater with a relaxed shape. Feels almost weightless! My only real complaint is that it pills pretty easily since it's so fluffy. I have two of these sweaters: one in grey and one in comet. They're both pretty soft and comfy, but I have to say that the comet feels much softer, and the neck on the grey one seems a bit floppier than the neck of the comet. 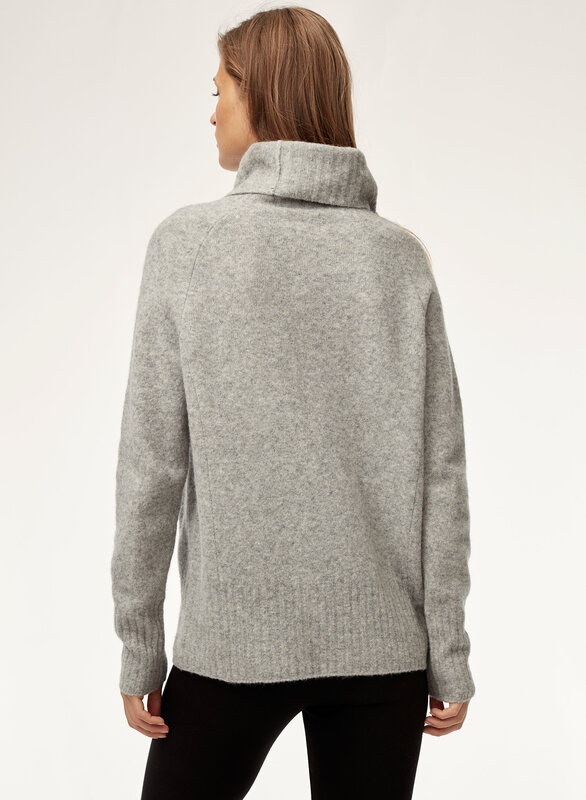 I absolutely love the Plutarch Sweater, just as of every other item in my wardrobe curated by Aritzia. The parallel dihoctomoy of the various fibers used from merino wool to yak really makes this sweater something special. Beautiful, soft, light...perfect. Very cozy, get lots of complements on it! 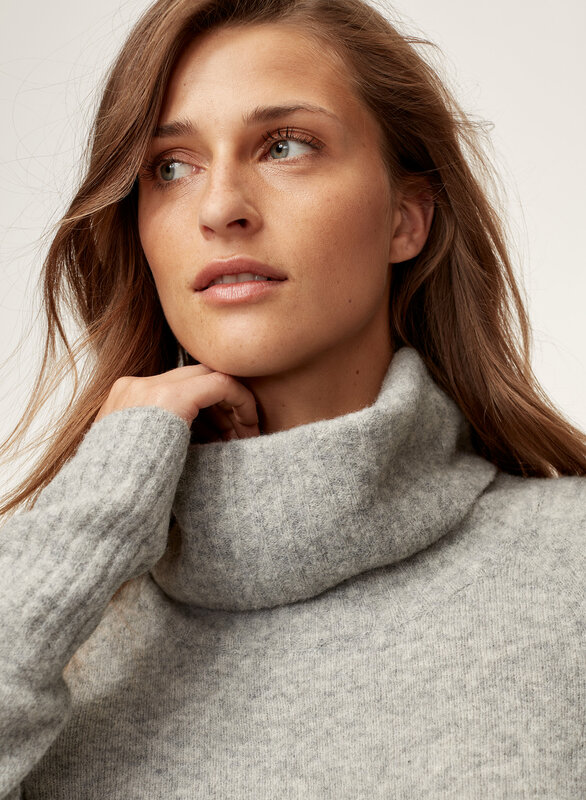 Fit is lovely, unfortunately for a $120+ sweater after one season the underarms are threadbare due to wear and the front of the sweater is all piled. Wish the quality was better. Definitely one of my favorite Aritzia sweaters! I have two colors already and can’t get over how soft and comfortable it is. The fit is quite loose. I usually wear a Medium and purchased a Small for this. I really enjoy the soft wool material that this item is made of; it feels so cozy whenever I wear it! It's almost like a blanket. It's delicacy is what intrigued me to make the purchase. I have not washed it yet so I am unsure if the outcome will be satisfactory after its first wash... all in all it is pleasant at the moment! Doesn't keep its shape for longer than the first 4 hours of wear. It is however not itchy at all and the fabric feels amazing especially for people like me who are sensitive to most sweater materials. Very warm and breathable. I really love the colour and everything else about it, I just wish it kept its initial shape and didn't look so sloppy even after I went down a size already. The turtle neck portion also doesn't stay up nicely and I constantly have to realign and adjust it. I've tired on previous years version of the Plutarch sweater this version is a better fit and definitely softer and less scratchy. Happy with my purchase. It does stretch easily though. This so comfy and beautiful. Highly recommend! I'm tall so the sleeves in my usual size were a bit short to look right. I think it could have worked, but might look nicer one size up - as I think it's intended to look oversized. Or at least that's how I'd want it. The material is a bit itchy, but probably fine with an undershirt. Still debating exchanging for a larger size. Size down! But so cozy. This sweater runs really big, so size down if you want a more fitted fit. But it's super cozy! This sweater is so comfy and warm. Very versatile and soft as well! This sweater does pill a bit though. 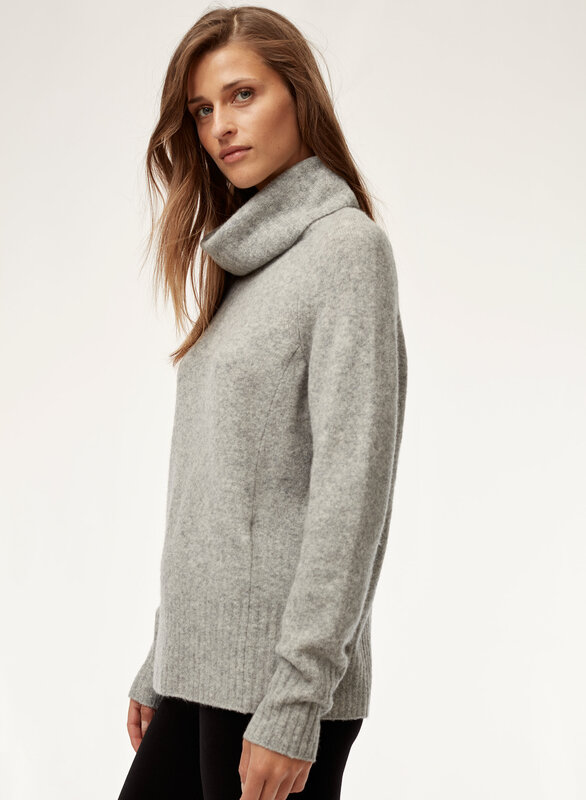 Love this roomy sweater (as all other aritzia sweaters), it's so flattering and long enough to wear with leggings. comfortable, stylish, and perfectly oversized! This sweater is extremely soft, and the fabric is luscious to the touch. The fit is a perfect mix between a classic sweater fit with an oversized fit. It falls so elegantly - perfectly into place and the seams down the side and back add a nice touch. I love this sweater! Warm, oversized without being overwhelming, and overall a perfect piece for a winter day. My only small complaint is that it is slightly scratchy--nothing unbearable, but not as soft as I usually like my sweaters. I love this sweater. 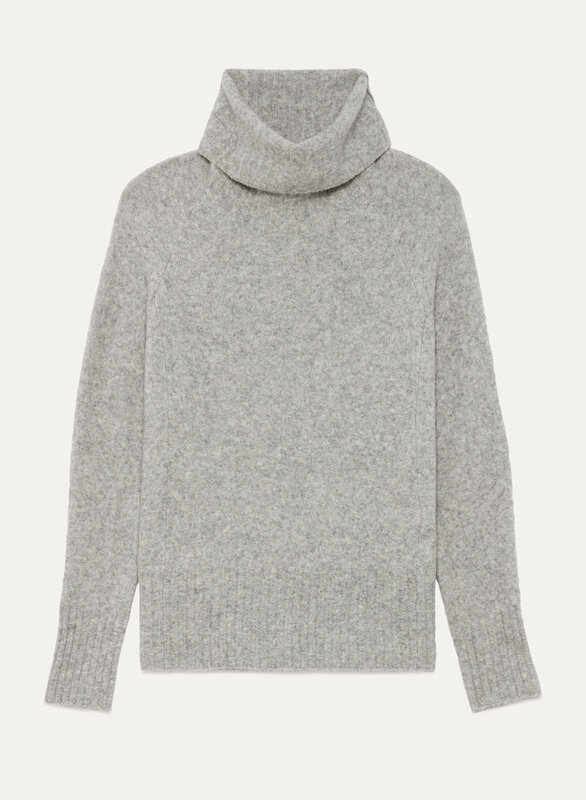 Versatile and oh so cozy. The wool makes it a bit itchy but that’s wool for you. Bought a small. These sweaters run large.